The 2019 Porsche Panamera GTS in Carmine Red. 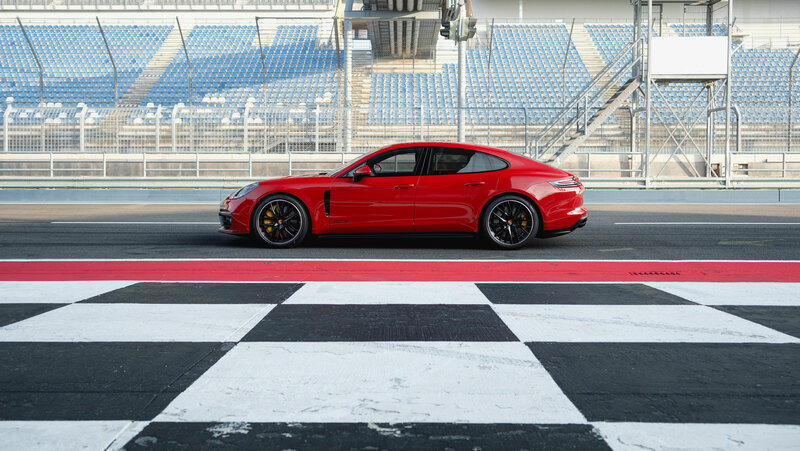 Just one short year after the launch of the second generation Porsche Panamera, the speedy sedan makes waves again with a punchier GTS variant. Characteristic of the trim, the exterior has been given contrasting accents for a more aggressive appearance. The air vents flanking the grille for instance are blacked out, and the car sits on dark 20-inch Panamera Design alloy wheels. 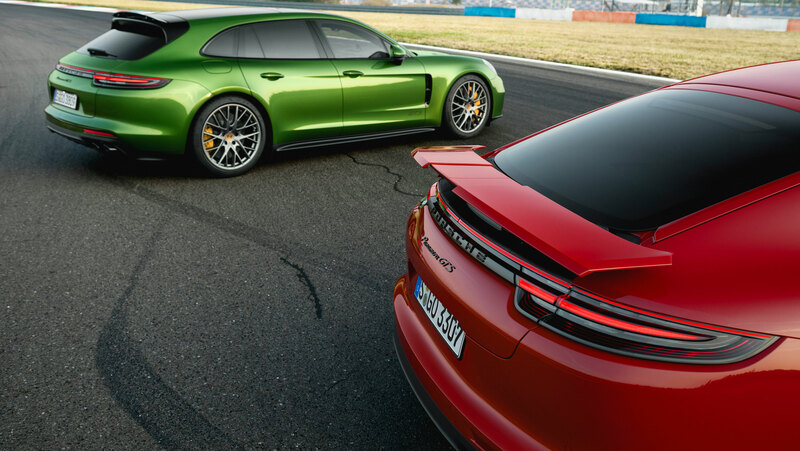 The Porsche script across the rear central brake light strip is smoked, and special GTS badging can be found on the bottom part of the doors and on the trunk lid. The theme is echoed inside the cabin — brushed aluminum is sprinkled throughout, as is Alcantara on the heated multifunction steering wheel with integrated paddle shifters. Buyers can purchase an optional GTS package allowing some personalization like a custom rev counter, alternate stitching and coloured GTS logos. A first for the range is the addition of a head-up display beaming information including speed and RPMs directly into the driver’s line of sight. 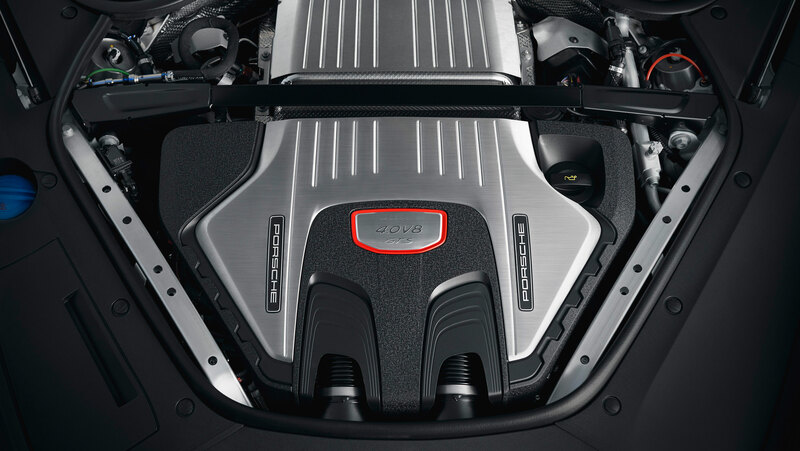 Under the hood, Porsche has managed to shoehorn in a twin-turbocharged 4.0-liter V8 pushing 460 horsepower and 457 lb-ft of torque, an additional 20 horsepower and 74 lb-ft compared to before. This allows the four-door to go from 0 to 100 km/h in just 4.1 seconds, topping out at 292 km/h. 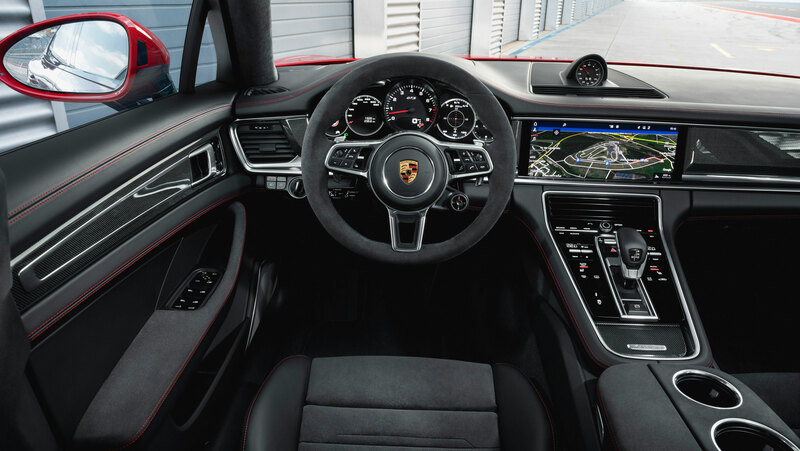 Helping control and put all that power to the ground is the brand’s excellent Porsche Doppelkupplung (PDK) dual-clutch eight-speed transmission and an all-wheel drive system aided by Porsche Traction Management. Straight line performance is all well and good, but the real fun is had when the road bends. Luckily, the GTS utilizes adaptive three-chamber air suspension allowing continuous and precise adjustments for dynamic handling as well as offering a high degree of ride comfort. The vehicle also sits 10 millimetre lower than its standard Panamera stablemates for an athletic stance. Stopping the car are big brakes, 390-millimetres in the front and 365 at the back. Debuting simultaneously is a Sport Turismo body style, which essentially is a wagon version. People choosing the slightly larger form factor benefit from more storage space, a large liftgate and low cargo loading edge and a four plus one seating layout. Regardless of trim level, all Panameras receive the new digital Porsche Advanced Cockpit eschewing traditional analogue gauges for virtual ones, InnoDrive adaptive cruise control with semi-autonomous driving capabilities, and available rear axle steering. Look for units to arrive into dealership in 2019.